Travel company Thomas Cook has resumed selling holidays in Tunisia to Britons for the first time since the attack at a resort in Sousse in 2015. Trips will resume in February 2018, after the Foreign and Commonwealth Office (FCO) eased its travel advice. The FCO previously advised avoiding all but essential visits following the June 2015 beach attack, which killed 38 people, including 30 British tourists. Thomas Cook said safety was its "first priority" in its sales to customers. Carol MacKenzie, Thomas Cook's head of customer welfare, said the firm followed government advice on where it offered flights and holidays, since "they are the experts in security". But she said holidaymakers had been asking when Tunisia resorts would be back on sale. "We also listen to our customers in where they want to go on holiday," she said. "Taking your loved ones anywhere is a serious decision and ultimately of course it's up to you where you choose to go on holiday," she added. 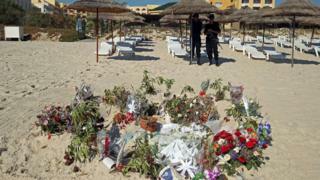 Thomas Cook did not stop selling trips to French, German and Belgian holidaymakers after the Sousse attack as their governments did not recommend against visiting Tunisia. In an update on 26 July, the FCO said it had "carefully reviewed conditions" in the country, including the terror threat and improvements in the Tunisian security forces. But it waned that terrorists were "still very likely to try to carry out attacks in Tunisia", telling people to avoid certain parts of the country. Tunisian officials said they expect the number of foreign tourists to increase to 6.5 million this year, up about 30% from 2016 - but down from the 6.9m peak in 2010.